The unusual Garston turf sided lock on the Kennet and Avon Canal at Theale in Berkshire. Keith Pritchard. The Bingley Five-Rise Locks near Bradford on the Leeds and Liverpool Canal. A five lock Staircase. Phil Crean. Lock on the Aylesbury Arm of the Grand Union Canal, Wilstone, Buckinghamshire. Geoff Howard. When I was a youngster my father took me away on an assignment to photograph an hotel boat on the Worcester and Birmingham Canal. Since then I have had an interest in Britain’s inland waterways, though not to the extent that I ever felt compelled to don a captain’s cap and take to the water! Ever since we started using rivers for transport we have been faced with the problem of changing levels. Most rivers at some point have a spot where differences in the bedrock lead to sudden changes in level and at first the only option was to get off the water and drag or carry your boat and all it’s contents round the obstacle. Then we started building weirs, but you still had to get round these so they built gates in them. These ‘flash’ locks were common on the Thames and worked by simply opening the gate and letting the boat shoot the torrent of water released, fine if you were going downstream, but very hard work going upstream where the boat would have to be physically hauled through against what would have been a strong flow. With the advent of the canal and the need to navigate them across Britain’s undulating landscape something else was needed, so they came up with the lock. A lock is basically a box with gates at each end, your boat enters the lock and the gate is closed, the lock is filled or emptied depending whether you are going up or down and the opposite gate is opened to let the boat proceed. Caen Hill locks. The ponds on the left act as reservoirs to conserve water. David Askham. Where you had a longer slope it was necessary to build a flight of locks, that is a sequence of locks with a stretch of level canal in-between. Some are quite strung out like Tardebigge on the Worcester and Birmingham Canal, 36 locks in 5.2km, others are more dramatic like Caen Hill on the Kennet and Avon Canal, 15 locks in about 950m. If the slope is quite steep then a staircase might be used. Superficially these look the same as a flight, but each lock actually opens directly into the next. 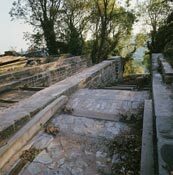 This may have solved the slope problem, but they were slower to navigate (boats could not go up at the same time other boats came down) and were wasteful of water, though the use of ‘apparent’ staircases, which had ponds to act as reservoirs, helped. Sometimes it was just not possible to build locks, perhaps because the drop was too extreme, so a couple of other methods were employed. The more common of these was the inclined plane. The boat entered either a cradle or a water filled caisson which was then hauled up a slope on rails. There were several in Britain, and though none are still in use you may still find the remains. The final alternative is a boat lift. These vary in design but basically consist of two suspended caissons that counterbalance each other as they are raised and lowered. There were several built, including seven on the Great Western Canal in Somerset, but they were hard to maintain and only one old lift, at Anderton between the Trent and Mersey canal and the River Weaver, remains. A new boat lift was recently built, The Falkirk Wheel in Scotland connecting the Forth and Clyde Canal with the Union Canal. More like a very wide ferris wheel, but basically still two caissons counterbalancing each other. Canals are generally looked upon as something from the past, but, as the Falkirk Wheel demonstrates, there are still developments happening. Entirely new canals have been proposed or are being built in Falkirk and Bedford (and perhaps elsewhere) and many redundant canals are being restored. The Lea Navigation was even improved in London to carry waste from the Olympic site, through which it runs, so they are perhaps going to be used seriously for freight again. Of course, you could just go over (or under) the undulations. But that is another story. Anderton Boat Lift. Brian Shuel. Construction and engineering work undertaken by British Waterways, to build a set of lock gates on the River Lee which will enable heavy building materials to be carried by river transport into the site of the 2012 London Olympic Complex. David Mansell.